It appears as though 2016 has been an eventful year in that Brexit was voted in favour, Trump was hailed in as the USA’s President and Italy’s Matteo Renzi’s constitutional referendum was defeated. These developments have repercussions and it appears that these repercussions also have knock-on effects in the fine wine market. In regards to the UK, Brexit was the biggest democratic decision and the largest voter turnout in the past 20 years. It was from this referendum that the UK chose to revolutionise its current relationship with the European Union (EU), which looks to completely transform the UK’s future trading activity. Since the result of the vote, prices within the fine wine market as a whole shot up by 15.07% (cumulatively, from 06/2016 – 11/2016) which when compared with last year’s performance (06/2015 – 11/2015) is a whole 15.47 Basis Points greater. With London being the global epicentre of the [secondary] fine wine market and the UK wine sector, as a whole, employing 270,000 and generating £17bn (in economic activity, annually), the effects of Brexit look to be extensive and intensive. 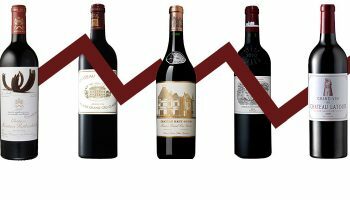 The aggressive uptick in prices looks to be the biggest wine investment news in the past 5 years, though, surprisingly, there has been little explanation for what has recently happened and its causes. With this sudden market change, there has been a renewed interest, but also a befitting concern for the future; inducing a cross-road for stockholders (buy, sell or hold?) and expectations of the UK fine wine market. These concerns, essentially, give rise to questions concerning the future source of demand, the future performance of the fine wine market and the effect of the UK’s financial-economic conditions (i.e., inflation, currency value, etc.) on the market, while the insistent price rises seem to have conjured an air of suspicion of a market bubble. Prior to the EU vote (23/06/2016), the fine wine market was clawing its way back in a very sedated manner at an average rate of 0.28% (between 01/2015 – 05/2016) and 4.85% cumulatively, coming off of a ~40% bursting of the market bubble in 2011. The bursting of the bubble was a result of reduced demand from China (due to national regulatory changes), the ever growing overinflated prices, the sequential production of several great vintages and the erosion of the financial incentive to buy en primeur, which all contributed to the inability of buyers and sellers to stomach the upward price pressures. From January 2015 to May 2016, the market had seen a low but welcoming growth of 0.41%, which can be attributed to several things; firstly, the demand from China managed to grow as Hong Kong and its preferable wine import tariffs were being utilised as an entry strategy (or proxy) into China and the associated business channels were being established. Secondly, wine merchants and traders reduced in quantity during the years after 2011; since a fall in industry profits induced a greater squeeze on individual businesses and their profits and this meant there was more market share available to merchants and traders that were able to withstand the depressive pressures. Lastly, the digitisation of the wine industry led to the availability of instantaneous information and resulted in a more connected industry (buyer and seller) as well as a more knowledgeable consumer, effectively increasing trading activity but also increasing frugality with transactional decision making. Positivity and confidence had been gaining little, but some ground up until the Brexit vote; there was, however, an apprehensive sentiment in markets across the economy. Since the vote, there has been a level of precariousness which can be revealed by several economic indicators. More telling was the talk amongst the wine industry where there was a preference for remaining within the UK-EU’s current configuration, [see the WSTA]. Many commentators, such as the Bordeaux Index (BI), correctly predicted that if we voted to leave then there would be a knee-jerk reaction in the currency markets. Corney & Barrow and Armit both made similar assertions, in that although we may face increased uncertainty, subsequent trends and alterations would be felt more over a prolonged period of time. With the mentioned differences between timeframes it is useful to inspect the past and check out the future(s); short- and long- runs. The ‘shock’ Brexit vote resulted in an immediate reaction from the international business, economic and financial communities. Plagued with sudden uncertainty, diminished confidence and windows of opportunity, individuals and institutions shuffled their money in different directions and new areas, with fine wine being one destination. Some lost out and others took advantage of the sudden shifts in market dynamics and currency values. Not only that but the saga continues with Trump and Italy, and looks to continue into 2017 and beyond with Italian, Dutch, German and French elections as well as the continuation of Trump. The chart below compares the growth rates of the fine wine Liv-Ex indices against the growth rates of several market benchmarks, such as the FTSE 250, UK inflation and UK gold prices. The chart shows the wine market’s performance and reaction to changes in economic conditions. + Since the EU referendum result (between 06/2016 – 11/2016), the fine wine market as a whole (represented by Live-Ex 1000 Index) grew by a total of 15.07%. During the same period the Liv-Ex index 50, 100, and 500 grew by 16.46%, 15.52%, and 14.67%, respectively. 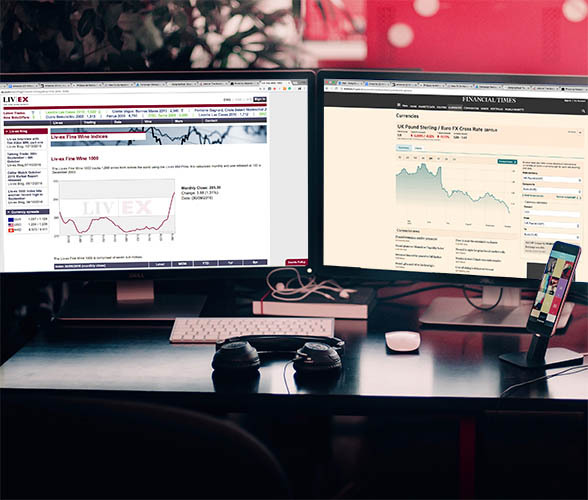 + The FTSE 250 was stunned, with the FTSE 250 falling 5.32% (06/2016). However, it subsequently recouped its losses in July 2016. + This graph highlights the change in behaviour of investors and buyers because of the vote. Both gold and fine wine acted similarly, with demand increasing under similar economic conditions, acting conversely to stocks. The rising inflation could push an alternative investment tactic and contributed to the increase in prices; with wine acting as a safe (or safer) haven for funds. + From 11/2015 – 04/2016, the Bordeaux wines have seen the greatest growth of 6.78% (out of the global wine regions), though the market still remains 7% lower than 5 years ago. 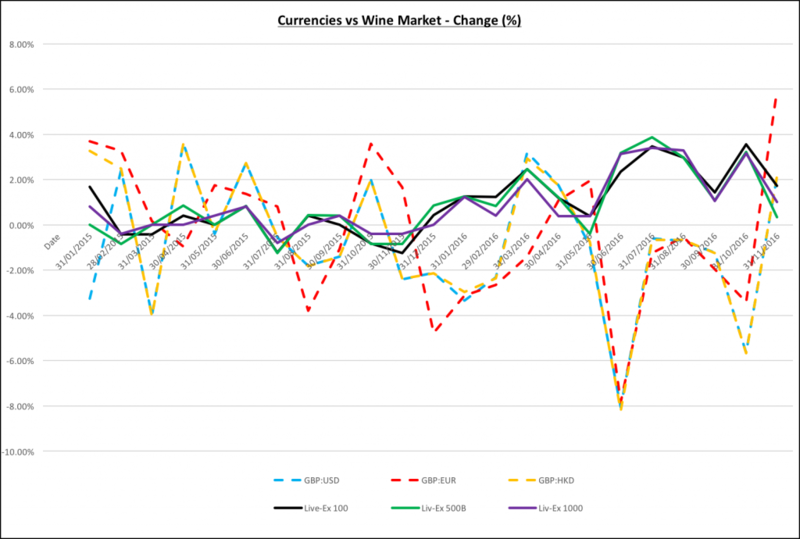 + The next graph looks specifically at the changes in the currency market against fine wine and reveals how sudden changes in the value of the pound can have such a drastic effect on the fine wine indices. The graph (if looked at long enough) may be indicative as to where the influx of demand stems from and could give some hints to a formal relationship. + Between 06/2015 – 06/2016 we saw the market get back to significant and positive growth rates despite the market failures of 2011. However, since the sharp decreases in GBP, where the pound now sits at a 31-year low, against the US Dollar, the Euro, and the Hong Kong Dollar, the wine indices have shown spectacular growth. + The pound slid against all major world currencies after the result of the referendum was announced; sliding 8.06%, 7.84% and 8.21% against USD, EUR and HKD. And, the pound has on a whole lost 14.11%, 9.06% and 14.28% against the USD, EUR and HKD from 06/2016 – 11/2016. What was witnessed was an international run on the pound. + By looking at 06/2016 and 11/2016, we can see that there does, in fact, seem to be a relationship between the weakness of the pound and the strength of indices (i.e., price growth) – as such, I feel it plausible to infer that there is an inverse relationship between fine wine and the pound. + The growth in prices can be predominantly attributed to an increase in demand which is then further fuelled by an increase in availability of supply, as dormant stockholders resume their activity and engagement with the market. + All three indices are an average 9.74% lower now than the market peaks of 07/2011, but 22.69% higher than the belt-tightening troughs of 10/2011. + Growth rates fell in November by an average (across all three indices) of 70.49% from the peak growth rates in 07/2016 and 69.55% a month on from October’s (2016) growth rates. + As a result of recent news surrounding Brexit, the election of Trump and the defeat of the Italian referendum, the pound has managed to regain some of its lost value, gaining 2.13%, 5.93% and 2.16% against USD, EUR and HKD (at the end of November 2016). Consequently, the average growth rate across the three indices sits at 1.03%, with the top 100 wines boosting the average. There are now grounds for determining what may (or may not) happen in the future, in respect to the fine wine market. It is a mixture of historic and future business and economic factors that describe my outlook of the market. The macroeconomic conditions have an influential effect on the behaviour of buyers and sellers within markets and economies. The general macroeconomic conditions of the UK are constantly changing. Rising inflation, a weakening of the pound, the redeployment of monetary stimulus and a reduction in interest rates all look to change the purchasing behaviour of businesses and consumers as yields are eroded on a real (net) basis for pension funds, savings and government bonds (Gilts), which may incentivise consumptive or hoarding behaviour. Not only that, but the changes to Britain’s external economic climate (the global economic environment) is swiftly altering. We have already seen the chancy and ambiguousness of Western states’ politics and we will most probably see more of the same, as similar feelings and forces harbour and feed off of the changeful nature and current softness of the global economy. There are definitely turbulent times ahead that look to upset the prevailing status-quo. One of the ambiguities that may alter the future of the wine industry is the goings on in the USA. So, with Trump selected to be the next president, what does this mean for the wine industry? One would assume that there would be a greater focus and push on American exports (i.e., American wines). However, this may be counteracted by a FED interest rate rise and an unwanted strengthening of the U.S. Dollar; with which the Hong Kong Dollar will closely follow in tandem. Hong Kong would be negatively affected by this strengthening and rate rise and it would dampen the competitiveness of its exports (i.e., wine). However, the Chinese Renminbi’s depreciation against the U.S. Dollar and the Hong Kong Dollar may well maintain some form of positive, upward growth in the wine indices. Both Trump and the FED rate rise looks to spell bad news for China and thus result in a more timid demand stemming from both China and Hong Kong. The big unknown concerns the stability of Europe as a union. 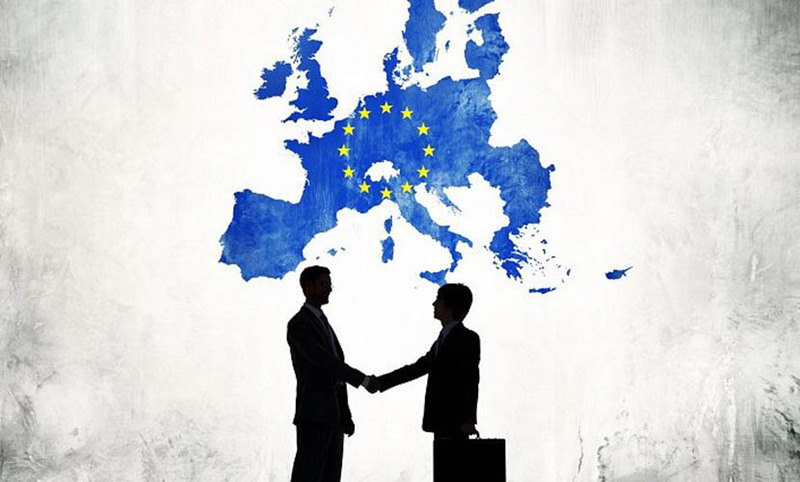 Trade not only rests upon the external economic climate of Europe but also the internal state of the European Union. With doubts developing over the future strength of the EU, one can be led to believe that volatility is here to stay for a while and as a result, internal and external trade relations hang in the balance. The Euro is experiencing a weakening and looks to be further affected by political sideshows that damage the stability of the Euro and could stir some greater interest, but not against the backdrop of a slowing China and a struggling EU bloc, though it may be that EU producers take a hiding from the economic conditions in the form of rising production inputs and increased costs in their supply chains in spite of the depreciating Euro, reducing supply and demand of wine. The furthering, albeit tapering, of the European Central Bank’s quantitative easing programme looks to further ease the pressure on highly indebted European states (i.e., Italy), but with increasing bond yields, confidence is temporarily fading and funds are finding elsewhere to sit (opportunity for wine investors?). In respect to the UK, though the pound has and may recoup some of its value, I perceive the pound to have found a new international purchasing power (benchmark) for the short-medium term. The aforementioned factors may increase interest and activity in the fine wine industry, producing further price rises; if anything history shows us that we could see greater polarisation or diversification in both the retail market and the investment market, with second-tier Bordeaux, Rhone, Burgundy and New World wines garnering greater interest, a trend which was seen during 2011-2014 when the most highly sought wines ridiculously escaped both their perceived and underlying value and the Bordeaux chateaux kept en primeur prices high. However, I think a likely potentiality is a gradual, long-term divestment away from French wines and into wines that carry shorter, yet favourable returns on investment. 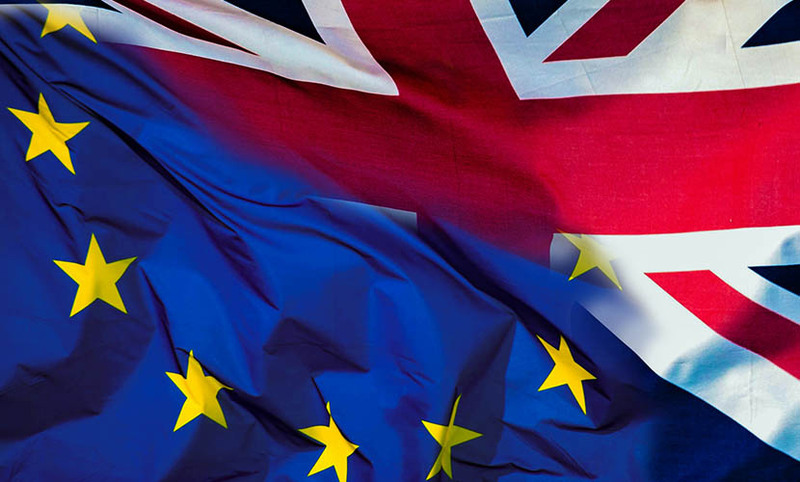 The UK’s economic health and subsequent external investor confidence, post-EU Referendum, presents a threat to the profits and successes of merchants, traders, logisticians, storage facilitators, and producers, globally. It’s possible that we might see a hollowing or thinning of the aforementioned and the consolidation of particular businesses, as seen during 2011-2014. The most obvious but extreme example is that further contractions in the pound and rapid growth of inflation may decrease industry profits creating a harsher, more competitive environment, causing some firms to go out of business. Future successes and profits are dependent on a mixture of windows of opportunity and stability, though medium- long-term stability is the riskier bet. Touching on the external climate, the fast-approaching European national elections present such an overwhelming level of instability on the horizon, for the wine market, through currency fluctuations. Besides Europe, the interaction between Trump and China looks to also create some friction, in the form of trade. The long-term outlook for the wine market is not necessarily bleak, but unforeseeable, as it rests upon so many probable eventualities and presents a grand risk for UK stockholders – that level of uncertainty is a crux for wine owners. 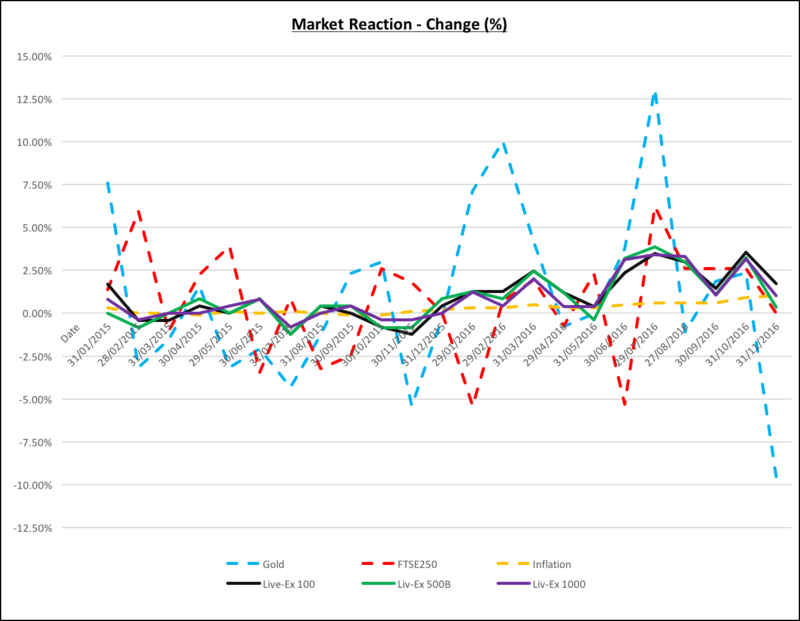 Recent data presents a picture of what has happened and helps forecast the possibilities and the reactions of buyers and sellers within the industry. 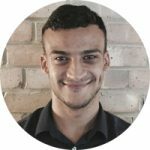 After the initial period of growth, we seem to be witnessing the stabilisation of price growth which is partly due to businesses adapting to new economic conditions but predominantly acts in accord with the currency markets; as the pound regains ground the growth stabilisation has occurred. Even though the drop in the pound caused this spike in interest, future plummets in the value of the pound may not necessarily prompt a replicated rise in demand, as the economic and market conditions would have changed and the arbitrage opportunities diminished or exhausted and businesses acclimatised. I am, in fact, dubious as to whether the market could stomach a similar price surge without there being negative repercussions on the international fluidity of stock and behaviour (i.e., trade interactions) between businesses and consumers. Talk of a market bubble can currently be dispelled as the price rises were not severe enough, nor were they sustained over a prolonged period of time. In addition, it does not appear that stock has ridiculously escaped its perceived value as there is still fluidity in the global wine market, though this could eventuality become so if growth continues at the aggressive rates seen or if we see more acute price spikes. The price rises appear to be fuelled by increases in demand, though where future increases in demand will come from is unknown; with some pointing at the return of China’s appetite or to new emerging markets – such as India. There are several more immediate threats to the UK fine wine market; one being that London’s competitive advantage as the optimal secondary market could be challenged from the likes of France (and Hong Kong) as storage legislation for bonded warehouses are changed and trade tariffs are altered. Another slightly more medium-term issue is the reinvigoration of Chinese demand. China (and Hong Kong) remains one of the largest export destinations of fine wine, but the volume remains below that of pre-2008 levels. I find it difficult to envisage a return to such volumes (in the short-medium term), as China goes through its very own macroeconomic adjustment, though they may return once purchasing, sales, logistics and information channels have been firmly established; when consumers acquire enough information; and when economic optimism returns to full capacity. Interestingly, research published by Faye, Massett and Weisskopf (2015) is more indicative of the possible future demand. The research notes that the Hong Kong fine wine auction premiums sat at an 8-year low in mid-2014, exhibiting a fall in Chinese demand (indirectly). However, there has been an upward tick in premiums emerging from late-2014. Overall, it is unlikely that we will see the highs and composition of demand similar to its previous forms, i.e., demand will be different in location, preferences, quantities, technology and so on. On 9th September, TMall, the subsidiary of Alibaba (A.K.A., the Chinese Amazon), held a wine & spirits festival in China, to develop the consumer market of wine enthusiasts. 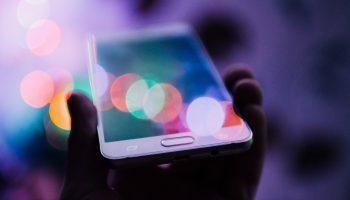 However, TMall’s sales figures have not, to this date, been released, which provokes rumours of disappointment and failure; this could be indicative of the time ahead for growth in demand. Resultantly, we should not possess sky-high expectations for the Chinese New Year; i.e., we should not expect a complete surge in demand and hold it to pre-2008 standards and pre-2011 prices. As a footnote, the USA is very unlikely to pick up any of the ‘demand slack’ in the wine market, neither is anyone else for the foreseeable future. It isn’t all doom and gloom. Opportunities still exist and exist because of change. Opportunity could emerge from a more polarised market and enable all folk (and newbies) to partake in the wine market. Or, as previously mentioned, it could come in the form of New World and Second Tier Bordeaux, Rhone and Burgundy wines gaining renewed interest and acquiring market share, in both the retail and investment circles. The obvious opportunity for UK stockholders is to profiteer from the price rises that work in their favour and sell their stock; this is the clearest window of opportunity since 2011 (5 years), although that window is slowly closing if it hasn’t already closed. The opposite is true for sterling-based wine enthusiasts looking to acquire particular stock – mainly first growths. However, there are good buys to be made; buys where demand has not risen for certain Tier One wines (i.e., the top 100 Bordeaux wines). For investment and collecting types, this may be a suitable time to diversify into different, well-performing regions or experience the joys of different wines from alternative countries. However, both parties may want to take advantage of the current climate just in case prices dip, the pound continues to recover, disposable incomes fall or prices further steepen. If one is an investor with a sizeable portfolio, a strategy would need to be devised to realise the wines that would be optimal to sell and the wines that would be optimal to keep; key factors would concern the drinking opportunity, the public opinion on the wine (e.g., the critic ratings), the historic performance (i.e., its market price) and its return on investment. On a more macro level, the UK may be in a more agile position to better its current position and improve its competitive advantages (e.g., its storage facilities or logistics providers) – as it is said, “pressure produces diamonds” and could maybe even initiate trends of divestments. Alternatively, this could be the chance for the UK to assert itself as a significant wine producing country or at least devise a strategy for doing so. In addition, there is scope for a regulatory or self-governing body, at an industrial level, to organise so as to have an agent to protect the international interests of the UK fine wine industry. Some organisations and institutions reacted negatively towards the result of the EU referendum. However, wine has gained from the foreign-denominated demand of fine wines, which I believe to be mainly attributed to the weak pound and opportunism from atomised, foreign currency denominated traders. I am personally sceptical of the reinvigorated performance of the fine wine market as I believe is built upon an arbitrary incident – it wasn’t organic growth, per se. Volatility is a very probable outcome in the short-medium term in the UK and global economy as well as the fine wine market, thus, I believe consumers, wine merchants, and fine wine prices will have ups and downs – here’s to a volatile beginning! The recent performance (i.e., growth rates) of the wine indices over the have been great, though the last month (November) has seen a sharp reduction in growth across all wine groups (indices). Further reductions in the value of the pound may induce price spikes and/or have negative consequences on the global fluidity of stock and on the profits of UK merchants, though changes elsewhere (Hong Kong, USA and China) look to have a more significant impact on the fluidity of stock and profits of merchants. Trump, the FED interest rate rise and strengthening of the USD against the Chinese Renminbi looks to change the behavior of wine traders and negatively impact the activity in the global wine trade (fluidity and profits), either resulting in a maintaining of small, yet positive growth or a fall in prices across the board of fine wines. Rumours of a wine bubble are simply just that, rumours, yet we cannot rule out the future possibility if price rises continue. We must expect regulatory changes to European fine wine practices, to which London’s historic position may have to alter to suit an altered global supply chain. In relation to China, we cannot expect a return to pre-2008 levels of demand and should not anticipate such in the short term – in addition, I do not believe another market (i.e., India) could pick up the demand slack at the moment. On a lighter note, the level of uncertainty and volatility poses insecurity, but also paints an opportunity; with great volatility comes great risk and reward [for some]. However, one should watch out for the not-too-distant future as greater change may be on the horizon. + Irexit – An Irish exit from the EU? Further European exits? Or the remedying of Brexit?